The Night Walks Down the Sky with the Moon depicts myth and mystery. The Milky Way glows in the dark sky sprinkled with stars as the deep purple night horse pushes the moon across the sky. 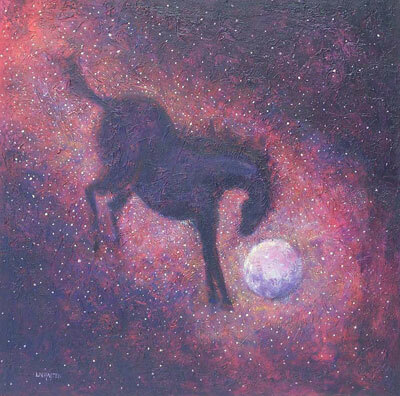 Richly colored in purple and lavender, the moon and the Milky Way glow with pale yellow and orange as the deep purple horse pushes the illuminating globe of a moon.